Nearly everyone has suffered from exam stress at some time in their lives. It’s all a part of taking exams. Once you start to feel stressed it can affect your body in many different ways. When your child reaches exam time it can be a stressful time for all involved but particularly for your child. In fact with college places and potential careers at stake, this could possibly be one of the most stressful times of your child’s life. Your child may feel tired, depressed, have difficulty sleeping, lack concentration, suffer from panic attacks, suffer from stomach upsets, get skin rashes and may be more likely to suffer from colds and flu. Your child may become irritable, intolerant and may even lose all perspective. However, not all of these symptoms may be present as stress affects different people in different ways. It is important that if any more severe symptoms arise, such as dizziness or palpitations, that you take your child to visit their GP. The race for success and the best marks can lead to a competition between siblings and friends, and this can have a negative impact on exam performance. It is possible that parents can actually affect their children’s chance of success by pressurizing them to do well. Many parents also suffer from exam stress and this can also aggravate the stress of the child. It is important to remain calm and as stress free as possible to help your child get through this difficult time. How can you as a parent/carer help your child to effectively beat exam stress? The following tips offer advice on how to do this. Make sure your child gets adequate sleep. 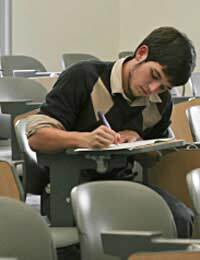 Many students will leave the bulk of their study until the last minute. This leads to late nights and a large amount of cramming. Encourage them to exercise regularly. Once your child is in studying mode they may try to cut out all extra activities including exercise. Fresh air and exercise is one of the best ways to counter stress, and it is important to make sure that your child gets outside and goes for a walk or partakes in their favourite sport. Exercise increases energy and can make one feel instantly better. It can also be a welcome break to your child from their books. Provide them with healthy food and include plenty of fruit in their diet. Your child may lose their appetite when suffering from exam stress but it is important to eat healthy meals to keep up their strength and include plenty of fruit for vitamins and nutrients. Help them to schedule a proper timetable with breaks included. Students often over focus on one particular subject that they are concerned about or want to do very well in. This can be to the detriment of other subjects. It is important to encourage your child to use a sensible exam timetable, allowing for regular breaks every hour or two and that cover each subject equally. Avoid caffeine. Many students up their intake of coffee to keep them going when studying late into the night. There can be a short-term benefit in terms of energy and concentration. However, it is extremely short (only minutes) and too much caffeine can lead to irritability and loss of concentration. According to research, students who sleep and eat well and regularly perform best in exams. Regular breaks allow the brain to process the information and gives the body some much-needed rest. It is important to remain positive throughout, and remind your child that their whole future does not depend on the result of their exams. There is always the possibility of repeating if they do not achieve the result they were hoping for, or they may find that all sorts of other opportunities arise.